Un esercizio modellato sui test d'ingresso alle scuole medie riguardante aggettivi e pronomi. Riconosci e distingui fra aggettivi e pronomi nelle seguenti frasi. 5)Chi ha scelto di mettere questo cd invece del mio? 10)Conosci il nome di chi ha creato la Apple? I don’t agree with _____ that he said. I’ve heard ________ their songs. She was given_________ the advice she needed. _________ world is experiencing climate change. I love that movie. I watch it ________ time. Un esercizio di lettura e comprensione in inglese. Leggi il brano e prova a rispondere alle domande relative (sono 15). Raven decided to steal the light. Raven waited until the old man’s daughter went down to the river to collect water. Just as she was dipping her basket into the river, he changed himself into a hemlock needle. The needle floated into her basket. When the girl drank some water, she swallowed Raven too. Inside the girl’s belly Raven took the form of a human baby. He grew and grew, and in time she gave birth to a funny looking child with black eyes and a big nose. The old man loved his grandson so much that he gave in to the child’s every wish. Raven became spoilt and greedy. He was bored with all his toys, and wanted to play with the box that held the light. Finally the grandfather opened the box and tossed the glowing ball of light to Raven. As soon as Raven caught the light, he immediately changed into his bird form. Holding the light in his beak, he flew up the chimney hole into the dark world. The magician was angry. He wanted to get the light back into his box. He flew after Raven. The light was heavy in Raven's beak, and he was getting tired. The magician was coming closer. Raven broke off some pieces of the light and threw them into the sky. They became the stars. 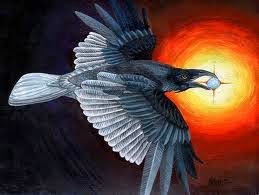 The magician was still coming closer, so Raven broke off another piece of the light and threw it into the sky. It became the moon. Finally Raven became so tired that he tossed the last and biggest piece of the light into the sky. It became the sun; and that is how daylight came to the world. 1)In the beginning the world was dark because there was no moon and sun. 2) Line 3 - What does hungry means? 3) Why didn't raven like the darkness? 4) What did the magician keep in the smallest box? 5) What did Raven decide to do? 6) What did Raven change himself into? 9)How did the old magician treat his grandson? 11)How did Raven get the light? 12) What happened as soon as Raven caught the light? 13)What did Raven do when he had the light? b.He cried "I have the light!" 14)Why did the magician fly after Raven? 16)How did the stars, moon, and sun get into the sky? a.The light fell out of Raven's beak and broke into pieces. b. Raven said," Let there be light." c.The light was too heavy,so Raven broke off some pieces and threw them into the sky. 2)a (Hungry means "desiring food"=affamato"
Mi avrebbe fatto molto piacere se __________ a mia sorella per chiederle scusa ieri. Sta per mettersi a piovere: se esci è meglio che ________ l'ombrello. Tutta la mia famiglia avrebbe voluto ________ con il figlio dell'avvocato, ma era talmente noioso che l'ho lasciato!